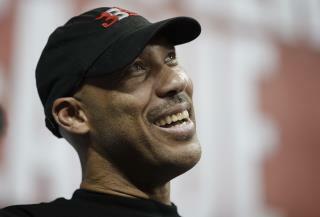 (Newser) – LaVar Ball doesn't like people messing with his sons: not Donald Trump, not NBA superstars, and not UCLA. Ball, the father of Los Angeles Lakers rookie Lonzo Ball, says he is pulling his second oldest, LiAngelo, out of UCLA in response to the school suspending him for shoplifting in China. LiAngelo Ball and two of his teammates were arrested and briefly detained last month, and their release set off a war of words between Ball and Trump. Now, per Bleacher Report, Ball has told several reporters that he and his son are "exploring other options." “I’m going to make him way better for the draft [than] UCLA ever could have," Ball said. Next on Newser: Teen Told Mom He Molested 2 Boys. He Told Cops 50. Two flaming narcissists never, ever can be yielding yardage to the other. Meet Donny T and LaVar, who seem to have created bizarre universes of enablers and browbeaten children whose only function is to reflect the amazing brilliance of the Parent. I feel sorry for the kids who bought into the family brand, and grew up with grossly distorted senses of their place, self-worth, and responsibilities in the world at large, and in the hearts of the Parent. This is not about political ideology, race, or wealth - it is about the pathology of narcissism and how it destroys from within. I know from experience. When I was a kid if I even brought something home that I found, I was told to take it back where I found it. I could not bring anything home that my parents did not buy for me. Parents today just dont question their kids as to where/how they got something expensive that they bring home. That mother that beat the crap out of her son in Baltimore because he was part of the breaking windows crowd, more parents today should have her values.